I would like to achieve the following, often used in a list of axioms. where the mathematical expressions are centred, possibly with equation numbers. the equations aren't centred perfectly. so there ought to be a better way. I would be fine to set the width of the text to 0 and inserting manual space to push the equation enough not to overlay the (description)s.
A description of IEEEeqnarray is available with texdoc IEEEtran. If you don't want numbers, then use IEEEeqnarray*, with the same syntax. How to create two series of the style of equation number in the same document? 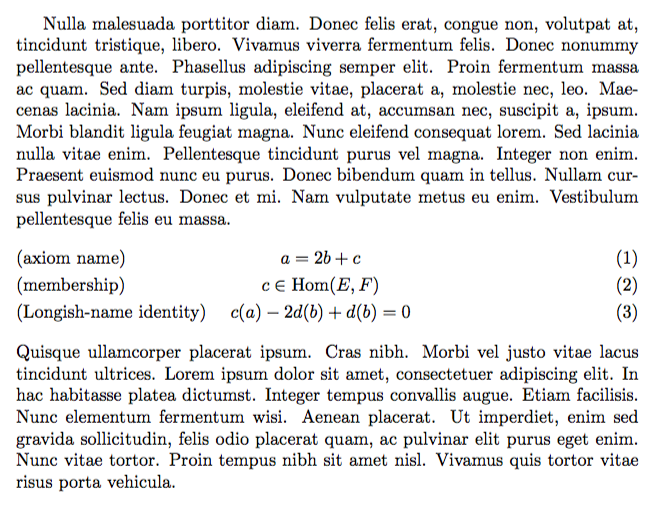 Is there a way to left align a simple equation without juggling spaces with hspace?